Hi guys and welcome to a new Tag Thursday! I know I’m about a year late to the hype, but I’ve finally given in to the Hamilton craze. If you don’t know , Hamilton is a hip-hop musical about the life of Alexander Hamilton, who was one of The United States’ Founding Fathers. And now here we are. I listen to the soundtrack at least two-three times a week and one of my goals in life is to memorize all the words to all the lyrics. (And oh boy, there are a lot of words). So what is the appeal of this musical? Personally, I just love the story. I didn’t think the story of an American politician living in the late 1700’s would be very interesting to me, but it is! It’s a story full of emotion: passion, drive, love, friendship, sadness, mourning, sacrifice and forgiveness. All the stuff I love in books, put into amazing lyrics and to some catchy beats. 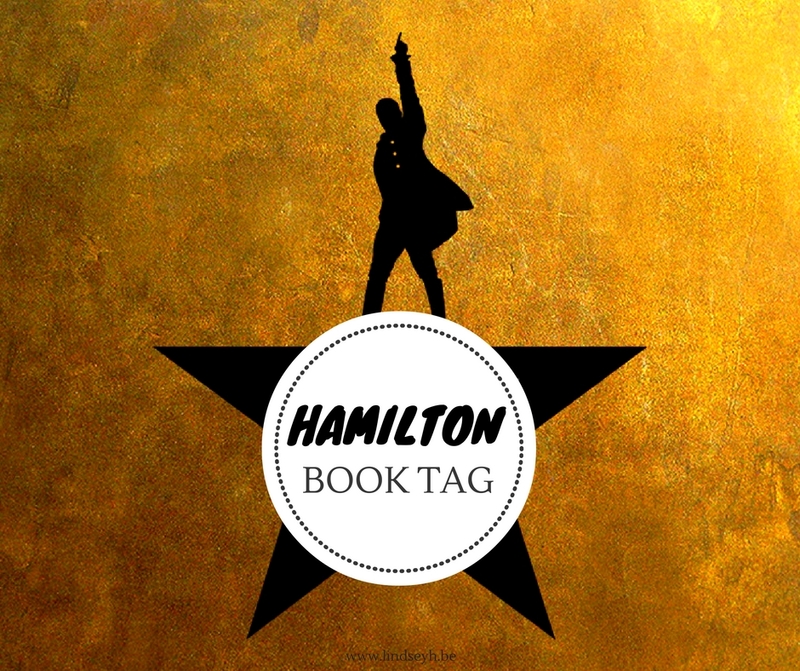 So why not mix two obsessions and do the Hamilton book tag? Let’s get to it! We dream of a brand new start, but we dream in the dark for the most part. Dark as a tomb where it happens. I’m going to be completely unoriginal here, because while I love a lot of book worlds, there is only one that I badly wish I could actually live in and that is the Wizarding World of Harry Potter. So listen to my declaration. I’m gonna go with Emily from Since You’ve Been Gone by Morgan Matson for this one. Sure, she’s just a regular girl in a contemporary story and not one of those badass heroines in fantasy, but she’s still pretty awesome and great! She’s a perfect example of why the small acts of bravery are just as awesome and inspiring as the big ones. Han from the Seven Realms series by Cinda Williams Chima. I love his cleverness and determination. I am still not over the dead of Fred Weasley. Nope. Not at all. *goes off to cry in a corner. SPOILERS for the Throne of Glass series! Highlight text to read. Celaena Sardothien and Sam Cortland in the Assassin’s Blade by Sarah J. Maas. I’m not sure if this counts as a spoiler, but just to be sure I’m counting it as one. I can’t even re-read the book because I’m afraid I won’t stop crying. That said, I think Celaena and Chaol is a close second. I know it’s not the same, but I still think it was equally devastating. I’m not really over that one either. Man, this Throne of Glass series is breaking my heart and still I love it so much! How about the Greenmantles in the Raven cycle by Maggie Stiefvater? They were both so sassy and funny, I didn’t know whether to find them terrifying or hilarious. You ever see somebody ruin their own life? SPOILERS! Highlight text to read. Red Queen by Victoria Aveyard. I personally did not see that coming at all, even though I totally should have. The Captive Prince series by C.S. Pacat. And really, I feel like this trilogy is best read all after eachother as if they are one book anyway. Six of Crows by Leigh Bardugo. I liked every single POV in this book and that doesn’t happen much so this is really saying something! Emma and Julian in Lady Midnight. They just belong together and I’m rooting for them so badly, but I’m sure we will still go through hell and back before we get a happily ever after. IF we even get one. Aelin versus Manon in Queen of Shadows by Sarah J. Maas. Oh man, I’ve been anticipating these two badasses meeting for a book and a half and when they finally did, it DID NOT DISAPPOINT! I don’t think anything really should be a guilty pleasure. I’m a firm advocate for reading whatever it is you feel like and just enjoy it without feeling guilty. You shouldn’t be ashamed of what you like to read! I want some more books in the Shatter Me world by Tahereh Mafi. I feel like there is still so much left to see there and so many questions still open. Also, I wouldn’t mind more Warner. Just saying. Oh I feel like I’m late to so many books and series, though I’m trying to catch up! This year I finally started a ton of them, including The Raven Cyle by Maggie Stiefvater, the Shades of Magic trilogy by V.E. Schwab, the Lunar Chronicles by Marissa Meyer and Outlander by Diana Gabaldon. If you like Hamilton, I tag you! I’d love to know your answers. Also, what’s your favorite Hamilton song? I’m so glad I finally gave into peer pressure and listened to this because now I’m obsessed ? I really need to do this tag! It’s on my list, but I just haven’t gotten around to it yet. I will forever choose Harry Pottter as the world I’d most like to visit so don’t worry haha!! The Greenmantles were very interesting villains! Haha, right!! I know Satisfied off by heart and some verses of Take A Break. I’m working on the rest ? And yes, exactly!!! The Wizarding World has everything that you could ever need ?